Courtesy of Time Out: Hong Kong and Disney/Pixar. Jim Morris has been president of Pixar Animation Studios since 2005. 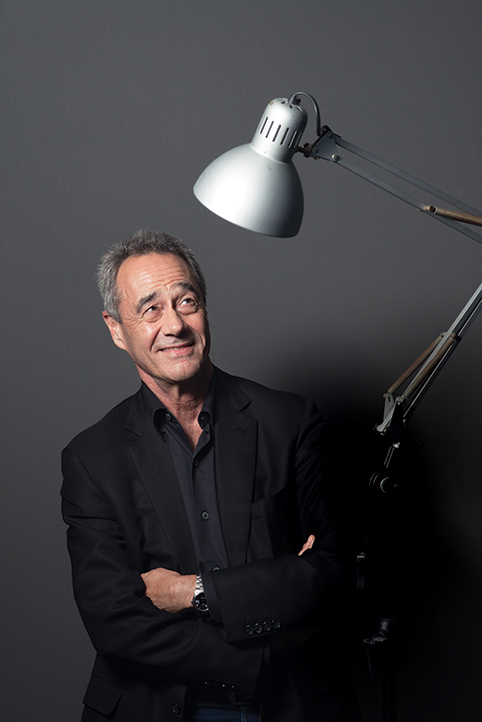 He came to Pixar after working for a lengthy period at Lucas Digital. While at LucasFilm, he helped make a slew of films including Harry Potter, Jurassic Park, and Star Wars; just to name a few. During a recent interview with Time Out: Hong Kong, Morris gave readers a little glimpse behind the scenes of Pixar and what it takes to create the animated films the studio is most famous for. One of the main discussion points during the interview was the fact that Pixar, for the first time in the studio’s history, was able to release two feature length films in 2015. According to Morris, Pixar’s original plan was to have at least one original film every other year, followed by a sequel every other year. The most important aspect behind every Pixar film is undoubtedly the story. Each Pixar film has been able to stand alone because of the unique characters that come along with the blend of animation and technology. In the scheme of storytelling at Pixar, the first step to launching a thousand feels is the emotional core behind each story. Storytelling aside, actually getting the film up on it’s feet after the initial concept is approved is tough enough. Most of the hours put into a film at Pixar exceed Walt Disney’s standards for his classic, 2-D animated films. There has been some criticism towards Pixar for it’s lack of women directors. Brenda Chapman has been the only female director to take the helm of a feature film for 2012’s Brave, but due to creative differences she was replaced by Mark Andrews halfway through production. Morris brought up that Pixar is indeed trying to fix this problem and make the company more diverse in regards to more opportunities for female storytellers. Before concluding the interview, Morris was able to dish that there is some NEW original content in the works for a series of films on top of the already scheduled (and very anticipated) studio line-up. It’s certainly strange thinking that far into the future about films at Pixar, but exciting to know there is some awesome content brewing at the studio and a new director in the loop. Be sure to check out the rest of the interview with Jim Morris over at Time Out! 2D Animation, Angus Maclane, Blu-Ray, DVD, Toy Story of Terror! "Toy Story of Terror! ", Pixar’s first TV special which premiered on ABC family last fall, will be available on Blu-ray and DVD this week and is filled with plenty of bonus features. One of these is a PSA in which Combat Carl (Carl Weathers) warns against the dangers of coughing. It’s a hilarious, tongue in cheek clip animated in 2D which you can watch below. Hopefully we’ll be seeing more of Combat Carl in future Toy Story shorts and specials! This brief ad is a brilliant way to continue his presence in the franchise. His appearance in "Toy Story of Terror!" made him yet another funny, colorful addition to this amazing cast of characters. The brains at Pixar obviously recognize his appeal in bringing us this gem, and it would be great to see more. The Pixar Times also reports that two other ads featuring new toys from the special center on Old Timer and Transitron. Whether those ads will also be in 2D remains to be seen, but we can expect them to be as funny and clever as Combat Carl’s urgent PSA. Update: the Old Timer and Transitron ads function as vintage toy commercials and they can be seen briefly in the Blu-ray trailer. All this and more is included, along with a ‘Team of Specialists’ feature, which has also been released by Disney. The clip takes audiences behind the scenes of "Toy Story of Terror! ", where director Angus MacLane explains the inclusion of certain toys in the special and offers a glimpse into the fascinating animation process. Be sure to grab "Toy Story of Terror!" on Blu-ray and DVD on August 19th. The part of the film that many moviegoers unfortunately take for granted is the credits sequence. It’s a shame because oftentimes they’re beautiful works of art, especially with Pixar films. Some have even suggested that there should be an Oscar category for Best Titles. Last year that buzz was carried by WALL•E. The Art of the Title Sequence sat down with the artists responsible for WALL•E’s credit roll. It’s no surprise that director Jim Capobianco and animator Alexander Woo have lots to say about this sequence. "Unlike… in the past, the main goal of the credits was to finish the story." We don’t usually get to read much about this aspect of the movie, so this interview is pretty informative and inspiring. The segment was, of course, inspired by the progression of art through history. Find out where the idea for the 2D animation and 8-bit graphics came from (and much more) in this intriguing interview. So do the folks at Pixar a favor and stay for the credits if you don’t already. I do, because every person who worked on the film is essential and deserves recognition! After a little delay with website issues, CGSociety caught up with and interviewed Pixar animator, Andrew Gordon, while in Melbourne for an Autodesk sponsored presentation. They chat about Gordon’s teaching career which includes the Academy of Art University, CSU Summer Arts and Animation Mentor. They also chat Pixar, 2D animation, the Spline Doctors and more. We do know (or at least one does hope the other knows), that Pixar’s 2009 release, UP, directed by Pete Docter, is going to be a 3D animated film. Pixar aren’t going to 2D, yet. In addition to this, ComingSoon.net, reporting from ShoWest, said that Disney have announced that the film will also be exhibited in 3-D. It seems it will go hand-in-hand with the three Toy Story releases over 2009-2010, that will also be in 3-D.
And I’ve always loved Pixar’s view on sequels and 3D. Things like “Sequels are not part of our business model” and “We’ll only do 3D if the story compliments it” have been said many times in many interviews. Then last year it was announced that the Bay-area based animation studio would be making a third Toy Story film. And then, in January, Disney made the big announcement that it would be released in Digital Disney 3D following the rerelease of the original two films, which would be remastered for three dimensional viewing. Add this onto the rumours that Disney•Pixar are going to make a Cars 2 and are eyeing a 2011 release date, and it just doesn’t sound like Pixar at all. Is it really necessary for the unstoppable duo to release these films in 3-D? I’ve never actually seen a film in 3-D, but it really just sounds like a cheap gimmick. But please, correct me if I am wrong. Leave a comment below and share your opinion. One downside is a problem most computer users suffer – hardware and software that’s out of date all too soon. "To resurrect the Toy Story characters for the third Toy Story [due in 2010] we had to find an old machine somebody still had," Walsh says. "It was being used as a coffee table. If they hadn’t saved it, we’d have lost the original Buzz and Woody animations." You can read the rest here. Thanks Guido. The Empire Online Blog posts the above video, which features a pencil test of Where The Wild Things are by John Lasseter which incorporates 3D backgrounds and 2D characters. Thanks Will. I can’t believe I haven’t seen this site before! It’s amazing. GhibliWorld.com have interviewed Pixar’s Enrico Casarosa, where they talk about Hayao Miyazaki’s influence on Enrico’s work, Up, Ratatouille and Studio Ghibli among other things. I think there’s another interesting difference between the stories directors choose to tell here and at Studio Ghibli. At Pixar directors often look for something personal from their own lives for inspiration. Andrew Stanton used some of his own anxieties of being a father to make Finding Nemo more authentic and true, that is the core of the story. You can pick every Pixar movie and connect it to some personal experience of its director. And that is a good rule in any kind of writing I’d say, the interesting thing though is that these experiences are mostly from adulthood. I think Miyazaki does something different: he puts on his “Super secret think like a 10 year old helmet” (he can switch age to younger and older too) and he’s going to tell a story from and for that point of view. It still baffles me that he’s able to do that, but it’s exactly that wonderful feeling of childish wonder that brings his movies to a whole other level. That ability seems to be also fueled by his nostalgia for those times. 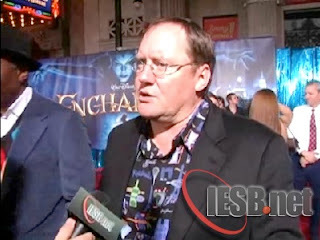 Silas Lesnick from IESB.net chatted with John Lasseter on the red carpet at the premiere of Enchanted. Lasseter chat’s about Enchanted, WD’s comeback to 2D animation, WALL•E and more.